Prev DIY Under-the-Sea Costumes: Fish! Next DIY Under-The-Sea Costumes: Octopus! 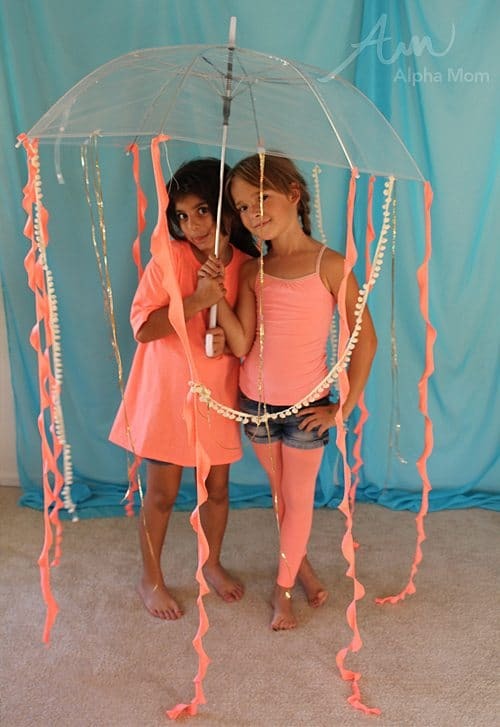 I know the jellyfish-made-from-an-umbrella costume has been done many times but I can’t very well create an under-the-sea costume series without including this magnificent NO-SEW wonder! I know, those tendrils look like some kind of fancy ruffling but they’re not. Simple, simple, simple! 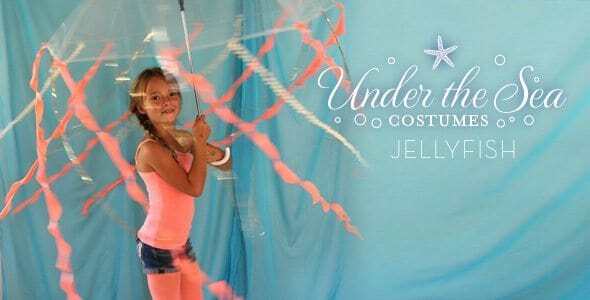 Everyone should rush out and get a clear umbrella right now and make this adorable Jellyfish costume. 2. Five or six 6-inch squares of fabric. Any kind will do. I bought some $1.98 fluorescent t-shirts and used them for fabric. Much cheaper and I didn’t have to stand in the cutting line at the fabric store (and you know what that can be like this time of year)! 3. Any other kind of notions you think will look pretty hanging from an umbrella and be tendril like. We used a string of tiny pom poms and some sequined thread but ribbons would work, even crepe paper steamers would work. 4. Something to attach the tendrils to the umbrella like quick-drying glue or even clear tape (note: hot glue does NOT work. It will melt your plastic umbrella and there goes all the fun). The first step is the trick. Take your six-inch square of fabric and round the edges so that it’s a circle. Then cut a spiral into the circle to the very center. When you unwrap the spiral it will hand down in a tight spiral (see photo above). It’s magic! Once you have all your tendrils cut, attach them to your umbrella with glue or tape. Add a cute coordinating outfit and you are ready to twirl! And just think, if it rains on Halloween night, you’re ready!